In the Tang dynasty (AD 618-906) it was customary to be buried with objects that represented daily life. Because the Chinese capital was the biggest, most cosmopolitan city in the world during the seventh and eighth centuries, burial goods often depict the exotic and rich living. This includes camels, foreigners and other representations of life on the Silk Road; the trade route across Central Asia that helped to make China so prosperous. This figure is one of a group of dancers and musicians which formed part of a set of burial objects in Tang dynasty China. They could be compared to the dancers and musicians that feature in descriptions of lavish banquets in some short stories from the Tang dynasty, which are among the earliest examples of Chinese fiction. They are made of low-fired ceramic, on which traces of red pigment remain. Originally they would have been painted all over with colourful pigment, and may even have had some gilded decoration, though this tended to be reserved for larger, grander figures. Although they look like sculpted figurines, these examples would have been mass-produced in two-part moulds, then fired and painted in a large workshop. 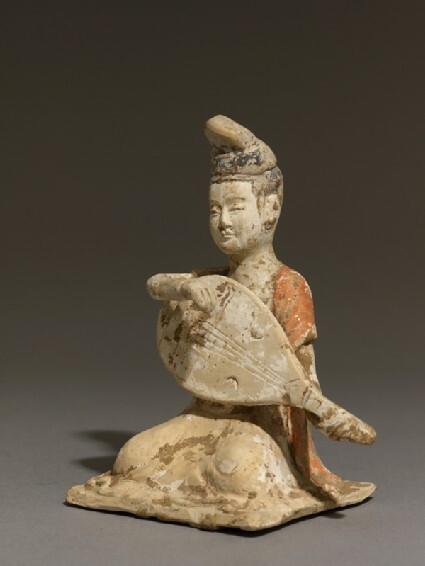 Earthenware figures were not made throughout the whole Tang dynasty, but mainly during the seventh and eighth centuries. Bequeathed by J. Gentilli, 1991.